Mosques: Mosques are the most well known and well-kept. They are the spiritual centre of the Islamic community. Muslims use the mosque for prayer, discussion and organizing help for people in need. The Alhambra in Grenada, Spain is an example of a Muslim palace or fort. The interior of many mosques share similar characteristics. Can you locate the following using the picture provided? a) minbar: a raised pulpit from which the imam (leader) gives his sermons. 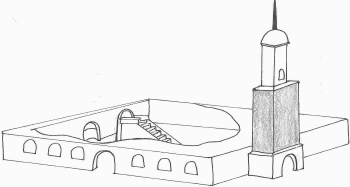 b) minaret: the highest point of a mosque. Traditionally, it is used to call people to prayers. 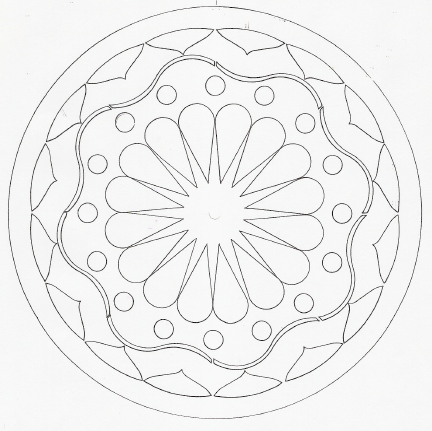 c) finial: the top of the minaret. d) mihrab: niche showing the direction of Mecca. Answer questions about your most difficult journey. i) What is the most difficult journey you have been on? ii) Where did you go? Who went with you? iii) What made the journey difficult? iv) Would you do the journey again? Why? Mosque floors are usually covered in carpets, and the mosque will have directions pointing to Mecca, the religious home of Muslim people. People remove their shoes, and often cover their heads before entering the mosque. People who make the Hajj pilgrimage to Mecca wear plain white clothes called ihram. They visit the Sacred Mosque. Inside the mosque is a stone cube covered in black cloth called the Ka’ba. Create a pattern of colour on the tile using only red, blue, purple, and gold. Create a building using geometric shapes. 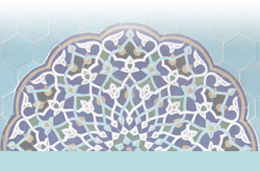 Many geometrical shapes were used in the building of mosques. 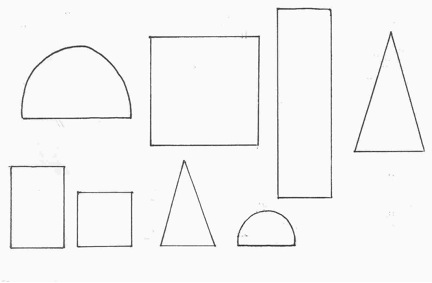 The shapes below could have been used in Islamic buildings. On a separate piece of paper, trace and cut out as many of the shapes as you need to create a building. Once you are happy with the design, glue the pieces in place. Forts and Palaces: The Alhambra in Grenada, Spain is an example of a Muslim palace or fort. It was built in the 13th century. The main colors and tiles are red, blue, gold and purple. Many were used in the building of mosques. These shapes could have been used.